I know, I know, it’s already more than two months after Christmas, why this post? I’ve been meaning to blog about it for some time, but the scan I had of what you’ll see next didn’t come out right. So I had to wait until I got my hands on it again, to finally do this post. To explain things first a bit, my family celebrates Christmas a little bit differently than most. Because we’re Dutch and Australian, it’s a bit of a mix of traditions. In the Netherlands you usually don’t celebrate Christmas, but Sinterklaas, which is the 5th of December. One of the traditions is that you do a sort of Secret Santa with your family (or with friends or at school), but also have to write a poem and hide your present in a “surprise” (pronounced the Dutch way that would be sir-preez-suh), a handcrafted something. I’ve had to do this a couple of times for school, making fake cactuses from paper and a teletubbie doll from clay and felt. Anyways, my family has never done the ‘surprise’ part, but at a certain moment (when me and my siblings were old enough) we did do the rest, but moved it to Christmas. So on Christmas day we do the usual presents under the tree, but also a Secret Santa with poems. Now some years I’ve done gimmicky ‘poems’. 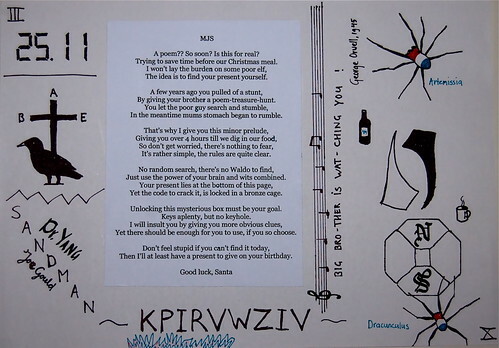 A poem for my brother a couple years back included cryptic clues to where he could find his presents. Another one for my brother was part in code. One poem for my mum was set on the tune of “O Holy Night”. I had so much trouble figuring this all out! I managed to solve a couple of clues, by the power that is Google, but I did need some help from my brother. Some of these clues led to other clues, some which helped with other parts I hadn’t solved yet. Before writing up a post on what all the clues are and how to solve it all, I thought I’d give you, dear readers, a chance of figuring it out. Two clues are Dutch/English language related, but they’re not even necessarily needed to solve it all. There are basically two type of clues in the ‘picture’: 1. clues that will lead to more clues that will lead to eventual instructions in how to open the NEWS puzzle, 2. clues that are actually instructions on how to open the NEWS puzzle. 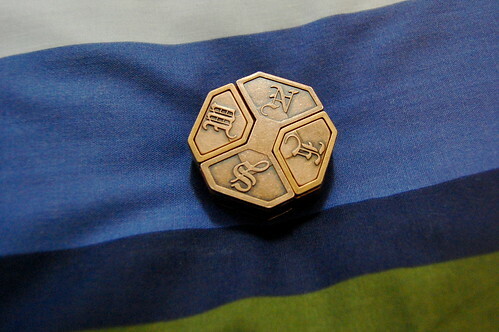 Plus there’s also the encrypted word at the bottem KPIRVWZIV, which is where my present was hidden. So, do you think you can solve any of the clues? Just brainstorm in the comments and I’ll let you know which ones are right and what leads to other clues.